Apple's and AirStrip's HIPAA compliant features were the most exciting part of its latest announcement. Apple’s Most Exciting New Design Feature? HIPAA Compliance. 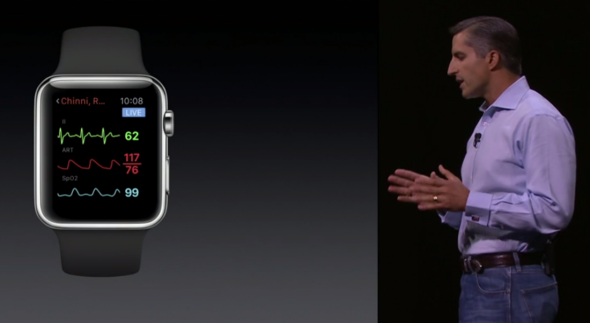 Dr. Cameron Powell of AirStrip demonstrates the Apple Watch integration of his company’s app. As it always does, Apple’s audience dutifully applauded as the company announced new products and services at its fall event Wednesday. Amid the usual array of familiar devices, slightly modified, the company demoed one truly intriguing product. With a third-party app from AirStrip, Apple Watch wearers will be able to send heart-rate data directly to their doctors. AirStrip’s technology is supposedly sophisticated enough to differentiate between a pregnant woman’s heart rate and that of a developing fetus. Much as the fetal heart-rate feature seemed to excite the audience, the potential for direct communication between patients and their doctors was the most promising detail in this announcement. As they currently stand, medical privacy laws in the United States have severely restricted the clinical potential of mobile technologies. Any successful attempt to work around these limitations could lead to tremendous and important changes in personal health care. Enacted in 1996, HIPAA—which stands for Healthcare Insurance Portability and Accountability Act—serves two primary functions. First, it helps patients move from one insurance company to another, facilitating the previously onerous process of transferring medical information between health care providers. Second, it protects the privacy of that information by imposing steep penalties on those who fail to treat test results, appointment schedules, and more with proper caution. Such regulations are obviously important, but they can also place serious roadblocks on the medical industry’s ability to adapt to new technologies. Because medical privacy laws are so stringent—and because many of them predate the rise of the Internet—ensuring that smartphones and other devices are HIPAA compliant can be difficult and costly. According to one expert, building the proper infrastructure can “cost $200,000 to $300,000, take months, or even years, to complete, and carry significant execution risk.” Attempting to use mobile devices in medical environments also means adhering to stringent security protocols, and even then compliance can be fuzzy. For some developers, these issues came to a head last summer when Apple released its HealthKit, which allows apps to share a user’s personal health information with one another. By providing a central hub for storing and sharing a user’s data, the company may have made things more difficult for app developers, who had to begin thinking more carefully about HIPAA guidelines. When Apple released its watch, it attempted to directly address some of these concerns. Perhaps most importantly, its secure messaging app allows physicians to communicate with their patients. The watch can also authenticate a user, helping to ensure that only authorized parties have access to privileged information. The company’s work with AirStrip both draws on and advances those developments. Apple’s work offers a powerful beacon to those who suffer from chronic illnesses. Medical wearables and other personal monitoring technologies generate a lot of information—but patients can’t always make sense of it on their own. As a type-1 diabetic, I collect an almost constant stream of data—blood sugar levels, carb consumption counts, insulin dosages, and so on. For the most part, I’m left to make sense of all this on my own. Because I see my endocrinologist every few months, we’re generally only able to discuss averages and general ratios. If I could more directly and immediately share the information I collect with her, she could develop a more complete picture of what it’s like to live with the disease from day to day, and perhaps even hour to hour. Exciting as all this is, there’s reason to be cautious for now. Much as Apple might like to see their watch in every home, perhaps on every wrist, it’s still a luxury product from a luxury brand. While the specific programs that Apple demoed onstage at its press event are impressive, they’re unlikely to be widely adopted, since they seemingly require all involved parties to own the same set of devices. Then again, maybe we can get our insurance companies to buy us all Apple Watches. That would be worth applauding.